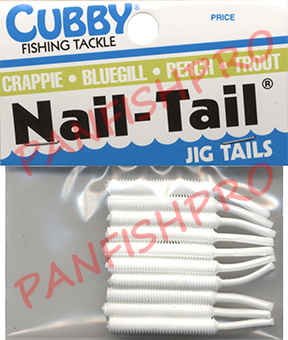 All Cubby Products are in-stock and will ship within two business days or less! 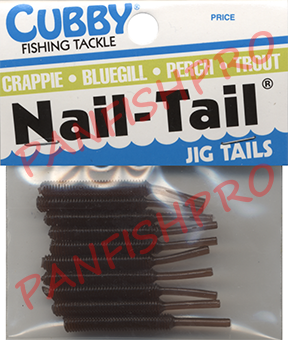 10 Cubby Nail-Tail Jig Tails. 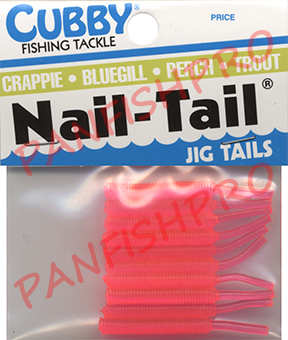 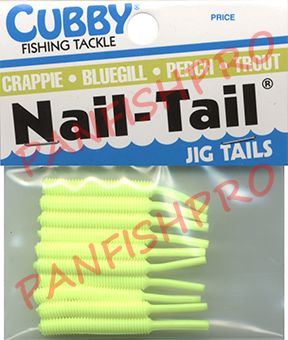 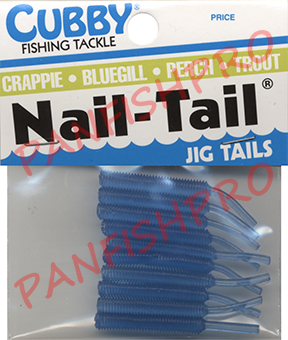 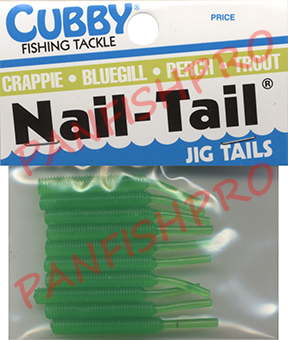 The Cubby Nail-Tail Jig tail is 1.75-inches in length. The Cubby Nail-Tail Jig Tail has been a long-time favorite of the pan-fishermen. 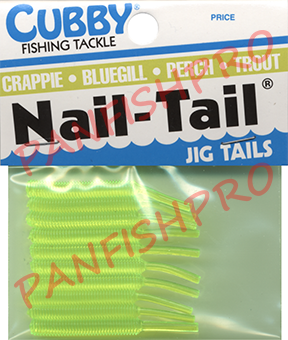 Use this jig tail full length, or cut to size for a smaller presentation. This jig tail works best rigged on a 1/32 or 1/64 ounce jig head with either a #8 or #6 hook. Our Panfishpro Pro-Quality 1/64 #8, 1/32 #8 and 1/32 #6 are a perfect match for this bait. 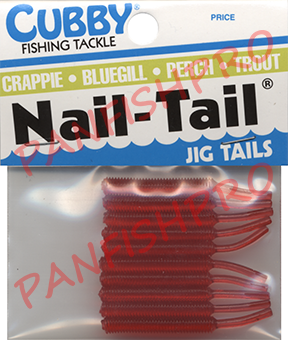 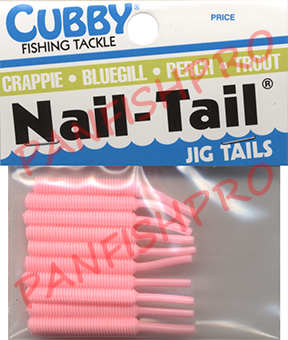 THE FOLLOWING NAMES ARE REGISTERED TRADEMARKS OF CUBBY FISHING TACKLE: BIG MINI-MITE, CUBBY, MINI-MITE, JIG-IN-A-TUBE, TRANS-GLO, NAIL TAILS, AND THE CONFIGURATION OF THE MINI-MITE FAMILY OF LURE TAILS. 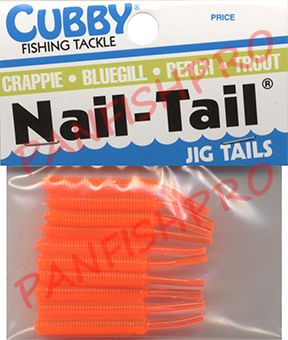 “PANFISHPRO” AND “MILLIONS OF FISH, COUNTLESS MEMORIES.” ARE REGISTERED TRADEMARK OF PANFISHPRO, LLC. 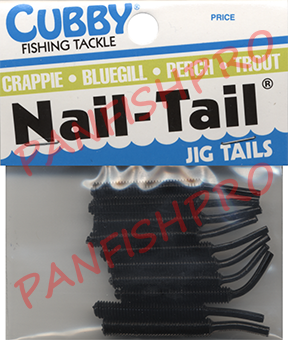 ALL PAGES © 2001 - 2019 PANFISHPRO, LLC.